Below is the planting guide for chard from The Farmer's Almanac. I highly recommended it for a planting guide if you are just getting started. Here is the direct link to The Farmer's Almanac Planting Guides. Chard is a member of the beet family that does well in both cool and warm temperatures. It can be cooked or used raw in salads and is high in vitamins A and C.
Plant chard seeds 2 to 3 weeks before the last spring frost date. Continue planting seeds at 10-day intervals for a month. For a fall harvest, plant chard seeds again about 40 days before the first fall frost date. Before planting, mix 1 cup of 5-10-10 fertilizer into the soil for every 20 feet of single row. Plant the seeds ½ to ¾ of inch deep in well-drained, rich, light soil. Space the seeds about 18 inches apart in single rows or 10 to 18 inches apart in wide rows. Sow eight to ten seeds per foot of row. When the plants are 3 to 4 inches tall, thin them out so that they are 4 to 6 inches apart or 9 to 12 inches apart if the plants are larger. Water the plants evenly to help them grow better. Water often during dry spells in the summer. You can also mulch the plants to help conserve moisture. For the best quality, cut the plants back when they are about 1 foot tall. If the chard plants become overgrown, they lose their flavor. You can start harvesting when the plants are 6 to 8 inches tall. Cut off the outer leaves 1-½ inches above the ground with a sharp knife. If you harvest the leaves carefully, new leaves will grow and provide another harvest. You can cut the ribs off the chard leaves and cook them like asparagus. The rest of the leaves are eaten as greens. You can cook them like spinach or eat them raw. You can store chard in the refrigerator in ventilated plastic bags. Below is the planting guide for beet from The Farmer's Almanac. I highly recommended it for a planting guide if you are just getting started. Here is the direct link to The Farmer's Almanac Planting Guides. Beets are a cool season vegetable crop. This root veggie grows quickly and has many different varieties which showcase deep red, yellow or white bulbs of different shapes. They can survive frost and almost freezing temperatures, which makes them a good choice for northern gardeners and an excellent long-season crop. A soil pH above 5.5–6 is best, otherwise growth will be stunted. Beets are a good indicator of soil pH. Till in aged manure before planting. Beets require especially good nutrition and a high phosphorus level to germinate. Go easy on nitrogen however, an excess will cause sprawling greens and tiny bulbs beneath the soil. Wait until soil reaches 50 degrees before planting. In zones with low moisture and rainfall, soak the seeds for 24 hours before planting. Early crop can be planted in March/April, and late crop anytime from June to September. Successive plantings are also possible as long as the weather doesn’t exceed 75 degrees F. Space plantings about 20 days apart. Winter crops are a definite possibility in Zone 9 and above. Thinning is necessary, as you may get more than one seedling out of each seed. Thin when they read about 2 inches high by pinching them off. Pulling them out of the ground may disturb the close surrounding roots of nearby seedlings. Established plants should be thinned to 3–4 inches between plants. Mulch and water well. Beets need to maintain plenty of moisture. Any necessary cultivation should be gentle, beets have shallow roots that are easily disturbed. Days to maturity tend to be between 50 and 70 for most varieties, although they can be harvested at any time you see fit. If you like larger bulbs, wait longer, but understand they will be tougher and woody. Don’t let greens grow above 6 inches before harvesting. Don’t forget about the tops! Beet greens have a delicious and distinctive flavor, and hold more nutrition than the roots. Fresh beets can be stored in the refrigerator for 5–7 days. Clipping the tops off beets will keep them fresher for longer. Leave about one inch of stem on each beet, and store the greens separately. For root cellar type storage, make sure you brush off any soil clinging to these crops, then store them in a cool, dry place. An unheated closet might do, or put them in a cooler in your basement. Beets can be frozen, canned and pickled. Read more about a new way to store beets in the root cellar. My Garden Seed Shop is Now Open On Shopify. I just opened my garden seed shop on Shopify. I am offering over 100 varieties of heirloom seeds. You can buy 100% cold pressed neem oil there as well as calcium nitrate for blossom end rot. If you want to attract butterflies, bees and beneficial insects to your garden, you can find a wildflower package and herbs for that purpose. The herb package is unique to my shop as I selected and mixed the seeds. More stuff will be added regularly. 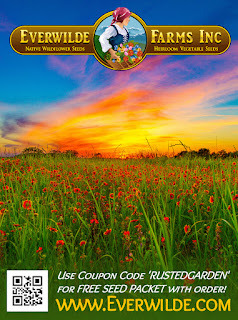 All kinds of discounted seed packages. All proceeds get turned back into The Rusted Garden in some capacity. If you have a chance, I could use a share to help let people know my shop is open. Thanks! We all know the importance of honey bees to our gardens and the world. We also know that herbs have countless culinary and medicinal uses. Did you know herbs can also be grown to attract the three B’s to your garden: Beneficial Insects, Butterflies and Bees? Tomatoes and peppers tend to self-pollinate but if you are growing cucumbers, squash, zucchini and melons, you definitely want the buzzing of bees and beneficial insects flying throughout your garden. Butterflies are attracted to many types of herbs and will use some of them as an integral part of their life cycle. Insects that eat insects will come to your garden, like ladybugs and hoverflies, and help take care of aphids and other unwanted visitors. Honey bees and bumble bees love the flowers from this mix of herbs. I put together a package of 6 specific herbs that will easily fill a 100 square feet. Plant a large area or several small areas and leave them to flower and reseed year after year. Just water them in for 10 days and forget them. Sure you can sneak in and collect a few leaves for yourself but these herbs are for the three B’s. Cilantro or Coriander is one of the best herbs for beneficial insects. The fragrant white flowers are a favorite of some of the smallest pollinators around. The flowers grow in a manner that makes their 'food' easily accessible to bees, beneficial insects and butterflies. It is an annual that can take the cold and heavily reseeds. Borage has bright blue star shaped flowers that are magnets for bees and other pollinators. They are full of nectar that the bees love and the flowers tend to bloom all season long. Borage is known as a honey plant and it is grown by many beekeepers near their apiaries. Even hummingbirds love it. Anise is another herb the produces masses of small white flowers and bees love them. Anise oil is used to attract bees. The fragrance has been proven to be a highly attractive scent for drawing in pollinators. Fennel is a preferred food source for butterflies. It is a delicacy for the Swallowtail. They will use the plant to host its eggs and you will see the life cycle of the butterfly. That is, you will see a lot of wildly colored caterpillars. Honey bees are also attracted to fennel and love their tiny yellow flowers. It has a wonderful anise licorice taste to its leaves and bulb. It is an annual in zones 3-9. It will reseed heavily. Dill is very similar to fennel. It has white flowers that are loved by the 3 B’s. Dill and fennel have similar leaf structures which are favored by developing caterpillars that will turn into butterflies. Predatory insects like ladybugs are drawn to the flowers and leaf structure of both dill and fennel. The gift of ladybugs is that they will take care of aphids in your garden. Dill is also a big favorite of hoverflies. Dill is an annual that will reseed heavily. Hyssop produces masses of dark blue flowers on spires that bloom July through September. You can cut back spent flowers for more blooms. This is a favorite of bees. You will see bees crawling up and down the spike of beautifully colored flowers. The leaves have a mint licorice scent and it is a perennial in Zones 4-8. The combination of these 6 herbs, planted in the corner of your garden, will bring in an army of beneficial predatory insects, honey bees, bumble bees, butterflies and even hummingbirds. The combined scents of the flowers and leaves will serve your garden well. Growing these herbs will provide a food source for honey bees, a home to the Swallowtail Caterpillars and a haven for all the good insects your gardens need. Hyssop is a perennial but will also seed heavily like the other five herbs. Your 3 B's garden will take care of itself year after year. You can pick these herbs up as you find them in your travels or purchase them from me as a package that can be scattered throughout your garden. The seeds are quite distinctive and you can easily pick them out for you own personal needs too! The seed picture above holds the measure of seeds that come in the package which is approximately 1/2 ounce. You can find this item and many more on my new Seed Shop and Garden Shop on Shopify at this link: The Rusted Garden Seed Shop. A mix of Cilantro, Dill, Anise, Borage, Fennel, an Hyssop. Approximately 1/2 ounce of herb seeds. No fillers! Seed and Garden Product Shop on Shopify. Click any link to got to my New Shop! 19% Calcium and Water Soluble!